Anton Maskeliade has just released his new single “One Beat”. It includes three abstract tracks which Anton recorded during the 1beat international festival. Anton is a frequent guest of various festivals in Florida, Washington, New York, and Lucerne. His next live event is in Stockholm, where he will present his new single at the invitation of Virus Radio. Maskeliade as an electronic musician and songwriter from Moscow. His live shows are always extremely imaginative and entertaining. Anton’s real surname is Sergeev. His uses the pseudonym Maskeliade in memory of his grandfather, whose surname was Maskelason. Anton says he is a distant kin of Mark Twain through that grandfather. Anton is a musician, but a very unusual one; he describes his own music as "ephemeral". During live shows he extracts his music from his laptop, making hocus-pocus gestures in the air over the screen, as if miming some famous orchestra conductor. 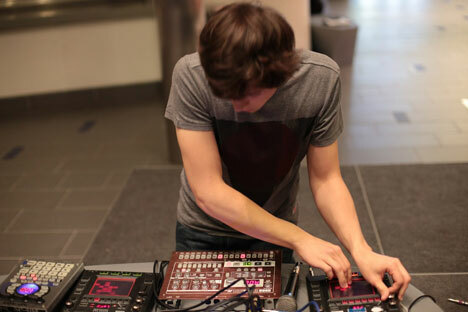 In fact, the 27-year-old uses a Leap Motion gesture controller and the Geco Midi application. Together they act like a thereminvox; the musician controls the sound by moving his hands in an electromagnetic field near two metallic antennas. But unlike thereminvox, which produces only one kind of sound, these new instruments can be used to produce countless varieties. As for how exactly the instrument reacts to hand movements, that can be programmed, too. Last spring Anton had a trip to the United States as part of the Onebeat cultural program. “When you talk to the best musicians in the world, the people who play the most unusual kinds of instruments, it’s really cool," Anton says. “It extends your instruments of perception.” Anton performed at 1beat together with Pakistani prodigy Usman Riaz; Chance McCoy, who is from the States; and Venezuela’s Edward Ramirez, winner of the Latin Grammy Awards.